A scan when I was only 30 days old, found a bleed on my brain. When Mum and Dad were taken into a little room and told this, their hearts broke. They were so afraid for my future... for what I might never do.... for how much harder I would have to try... and for what other people might think. Now, they make sure that I get the therapy and stretches I need. They make sure they are being patient with me, without letting me become lazy. They support me and they love me. They stretch my muscles and help me learn. They love me. Before my family found out about my brain damage, none of us knew much about cerebral palsy. That's strange, because cerebral palsy is the most common physical disability in children. Every 15 hours, an Australian baby is born and they will live a cerebral palsy life, like me. There's no cure, and we will live with cerebral palsy our whole lives. It will never 'go away' and we will never 'grow out of it'. When I was tiny, my family realised that their dreams for me were just as important, but the dreams might have to change a little bit. At 3 years old, I don't independently sit up, yet. I don't crawl, yet. I can't tell Mum and Dad how much I love them - with my words, yet. I'm not toilet trained, yet. If Mum and Dad measured my performances against my peers, they'd be devastated by how little I have achieved. But, my Mum and Dad have a boy with special needs... a boy with cerebral palsy, and they have to measure performances differently. I came home drinking Mum's milk. Many, many people told Mum I would not be able to do that! Now, I am eating chunks in my food, and we never knew whether I'd be able to do that. I am really just mushing a lot of the food, not chewing it... but we all know I can bite. I've left evidence on fingers! I do grind my teeth, though, so I don't really have much in the way of molars. At three, I've also started trying to hold the spoon, bring it to my mouth and eat from it. Watch that here. I am getting much stronger in my torso and and holding my head higher and higher, for longer and longer! I roll over easily now and I am getting around the room, using my own unique style. Once, Mum left my sister and I while she had a shower. No one else was home and my sister started to cry. I get really worried when she cries and no one helps her... There was no one else, so I knew I had to help her. I moved across the room. I often can't see well, but I followed her voice, like my family have taught me. I found my sister and I held her foot. I wanted her to know she was ok.
Maybe I'm not like most kids my age. But... I'm kind and brave, clever and happy. So I might not be the 'best reader in my class', but my family have had to learn that we measure things differently. We measure the little things. The perseverance and the triumphs. We count the smiles. My world is so filled with love and encouragement, that I have no option but to be a brave and determined Little Man. Mum hurts me a little when she stretches out my hips, and Dad watches bravely. I clench my fists and turn my head, but I don't even really complain. I don't like it, but I know Mum and Dad are helping me... helping my future. They listen to people with experiences beyond our own and adjust things for me. They stand up and fight for me, when they feel they need to. They love me, everyday, without question. My cerebral palsy costs a lot of money. I need a lot of specialised equipment, if I am to develop in every way I can. I work with a great physiotherapist. My chemotherapy had a negative impact on my development and growth... but, we will never know exactly what that was. I am feeling healthy, and I am getting much stronger. To help me learn to stand, to develop bone density and to support my ankles, I wear leg braces, or AFOs, when I stand. I also have thumb splints, which help me remember to keep my thumb loose - sometimes, I clench my fists and my thumb is wrapped in my fingers. I am much better at using my hands now and my fingers are usually open and relaxed. When I am concentrating on my exercises, or I am frustrated, my hands clench up again. I am learning to support myself in a crawling position. I now have arm wraps, to help keep my arms straight and strong. I am developing strength in my torso and I am getting better at sitting with less support. I also have a 'switch', which is a recording device, so Mum records herself saying different things. Often, the recording is: 'kisses', 'more kisses', 'thanks'. When I touch the button, the recording is activated and I hear 'kisses'. I am then kissed. I touch the switch again, only to hear 'more kisses' and they kiss me again! I have helped Mum to read 'Where is the Green Sheep' using the switch and can ask for more dinner. I got a new switch! I still need help sitting, but my family can leave me on the couch for longer before I slouch over. I am be able to sit for about ten seconds at a time- unsupported - before I fall over. I have to be put into a seated position. Usually, I sit cross-legged, but I also have to do straight legged sitting, to stretch out my muscles. I have arm wraps, to help my arms stay strong, while I am sitting. I still need to be completely supported while taking steps, but I go further and my steps are stronger. I especially like walking to the highchair for lunch and dinner! I splash in the bath – so much so that nothing remains dry. I love the water! I have always been a very serious boy, but I am laughing more. Dad can always make me laugh. I am so proud of myself, as I should be! Everyone who loves me is so proud of me; they see how determined I am and how much I try. Every little step, every little achievement, every little milestone – we celebrate every one, because we know we are lucky. My future is still unknown – we don’t know if I will crawl or walk. But we do know that I am a very determined little man and everyone is so thankful for that. This was my first standing frame... In this photo, I'm being treated for my hepatoblastoma (liver cancer). Standing time is good for all parts of my body. It improves my bone density, helps with digestion and toileting and gives me a new way to see the world. I needed a new standing frame, once I got too tall. In my blue standing frame, I learned how to throw toys to the floor, which made Mum's heart sing. I'm in my standing frame, everyday, for up to two hours each time. My standing frame cost over $7000. We won $5000, and the Minnamurra Lions Club supported us, with the rest. I got a new chair! It can be used as a high chair, and it can be lowered to the ground. It cost about $9000, and was funded by the Clarke family, Minnamurra Lions Club and other donations made during the year. My walker cost about $4000. I was given one, by a kind, anonymous man. Some days, I do really well in my walker, and some days, I hardly move an inch. I was given some TheraTogs. They cost about $500. They are like a special skin, and when you wear them, they help your muscles 'switch on'. My pram has been adapted to provide me with the support I need. It can be adjusted, as I grow. Once I get too big, I will get my first wheelchair. I got mine from the One Fitness 24/7 gym. We love it. It means we can go to the beach, anytime. It cost about $4,500. 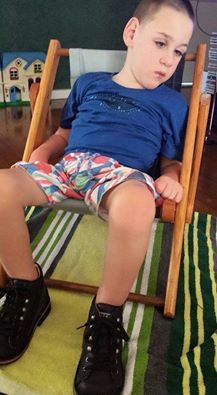 We wrote a list of beach wheelchairs for public use in Australia. - Find them here. We trialed our first wheelchairs, and are in the process of getting one. The waiting list is 12 months long, and that's just to find out whether we can get funding. With modifications, we're looking at about $14,000. I have a bike! I am fully strapped in: hands, feet and body. There are large trainer wheels, for stability, and I can be pulled along. It was made by TAD NSW, with some money coming from a fundraiser, and the rest from Minnamurra Lions. It cost about $1,000. I have a modified toilet. It's a supportive seat, over a 'bowl'. Mum used to hold me over the toilet, hugging the bowl. Now, she can strap me in and I can use the toilet by myself. It cost about $3,500. Mine is a hospital styled bed. It can be lowered and raised, and can bend, to have my head higher. I need it because I cannot climb in and out of a bed. I have a hoist, which will be used to lift me, once I get too heavy. We got Dexter some 'therapy' shoes. They are sturdy and very supportive. They are easy to put on and take off. They are easy to do up. They were bought second hand, and cost about $170. The shoes are quite heavy, and this additional weight helps Dexter with his sitting and standing. He got them in March 2014. 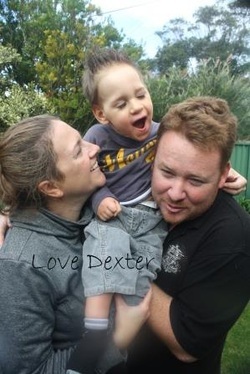 Dexter has needed some surgical procedures, because of his cerebral palsy. Because his legs were turning in, the surgeons tried to correct it with a hip abduction. Dexter's muscles were released, to reduce the tightness. It didn't work. Dexter then had a femoral osteotomy (his femor was cut, and turned back into the correct position and steel pins were placed into his leg.) We nearly lost him, with this procedure (bad reaction to pain medication), and he suffered incredible pain, because the surgery is very painful. Both surgeries saw Dexter in casts and braces for weeks. He lost his muscle strength, both times, and was set back approximately 18 months in his development, following the femoral osteotomy. Now, he's regaining his strength. His leg is two centimetres shorter, and it is still turning in. Despite our show of bravado, surgery always scares us. Australian accessible toilets are shown here. You can search for specific needs, on the map. Childrens' books with a main character who has a disability - here. 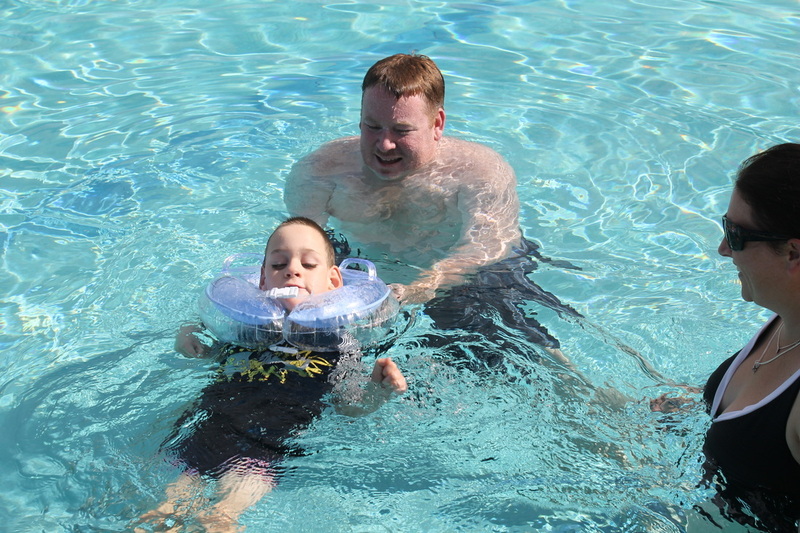 The main character is strong and determined, and has cerebral palsy. Click on the bottom right hand corner, to make the videos fill the screen.